Edit your life — declutter and organize your space. My last post addressed the subject of decluttering your mind. 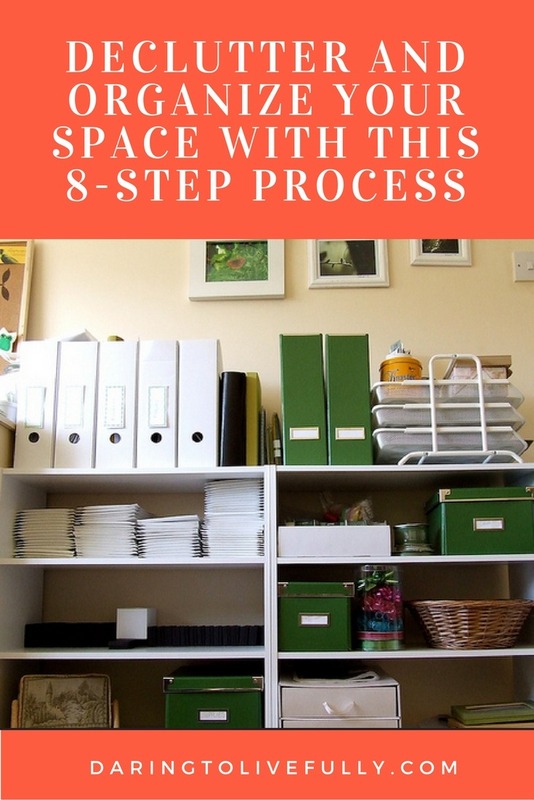 This post will show you how to declutter and organize your space. Decluttering means examining your life, going through all of your possessions, deciding what’s important to you, and discarding the rest. It means letting go of the things that no longer serve a purpose in your life so that you can make room for what’s most important to you. Organizing means that everything has a home so that it can be easily found, accessed, used, and put back. The time that you invest in decluttering and organizing will be returned to you, with dividends, once you’ve created a space that contains only what you really need–or truly brings you joy–and everything can be easily found and accessed. You can declutter and organize in micro-movements. This is a term coined by the author SARK which consists of taking tiny baby steps forward. Micro-movements can consist of very short sessions that last from one to five minutes each. You can declutter and organize in fifteen minute sessions. You can set aside one-hour-a-day to declutter. You can have a decluttering and organizing marathon that lasts three or four days. You can even create a schedule for decluttering and organizing in 365-days by doing a little bit each day, every day of the year. How you choose to do it depends on what works best for your personality and your schedule. Simply decide how much time you’ll spend organizing per session, and pencil it into your agenda. Scheduling your decluttering time is key! The den can be designated as a place for the family to gather and watch television, play boardgames, bond, and have fun. The mood you may want to foster here is comfort and connectivity. You might want to create a spa-like environment in your bathroom so that it serves as a luxurious retreat. The purpose of the laundry room could be to wash, dry, fold, iron, and hang clothes and linens with minimal pileup. You can define the kitchen as a place to prepare fresh, healthy food and snacks, and where each meal is a celebration. Maybe you want the master bedroom to be a romantic retreat. Your living room could be a place to entertain guests in an ambiance that is simple yet elegant, as well as serene and functional. You’re going to organize according to the function you want each room to serve, and how you want each room to “feel”. A room can have several different purposes. You need to identify the different activities that take place within each room and divide each room into zones. These zones will become the center for specific items related to the designated activity. Set up your space so that everything that you need to accomplish a particular activity is close at hand. For example, you can create a library area in your living room and place most of the books in your home in this area. Add a comfortable chair, make sure that there’s adequate lighting, and include a side table to place coffee mugs and reading snacks. You can also place a basket next to the chair in which you can keep magazines and newspapers. Many people are tempted to begin their decluttering and organizational efforts by starting with drawers, the cabinet underneath the bathroom sink, the hallway-closet, and so on. However, you’ll be much more effective if you begin with things that are visible. First of all, you should start with the room that you use most often. Begin clearing off the visible clutter, such as putting away anything on desktops, tabletops, and countertops that doesn’t belong there, and anything that’s on the floor. In addition, think of what furniture you can eliminate without sacrificing comfort and livability. After you’ve cleared off the visible clutter, you’re ready to move on to drawers, shelves, cupboards, cabinets, the linen closet, and so on. Start at the door and work clockwise around the room. Once you’re done with the room that you use most often, go on to the second-most-often-used room, then the third, and so on. Remember to concentrate on one room at a time. Does the item serve a key function in your daily life? Do you have another one that is better? Have you used this item in the past six months? Would the person that you’re trying to become own this item? This belongs in another room. This needs to be fixed or cleaned. This will be thrown out. If you’re decluttering a drawer, cabinet, or shelf, take everything out and put it in front of you where you can see everything. Sort through the pile and put related items together. Don’t get bogged down in specific, precise categories, just create simple groups so that it’s easier to get everything organized. Declutter your dishes, cups, and glasses. As you go through each category decide whether it’s something that will be put back, or if it’s going into one of the six boxes. Then put back the things that you’ve decided to keep, in an orderly manner. Remember that items which you use frequently should be easily accessible. Also remember that you need to store items where they are used. If you frequently use a pair of scissors in your family room, keep it in a drawer nearby, not in the kitchen or in your office at the other side of the house. If you come across a book you haven’t finished reading, don’t sit down to read it. If you come across a craft project that needs a few more stitches, now is not the time to finish it. In addition, keep a notebook with you so that you can jot down any repairs that need to be made or add incomplete projects to your to-do list. Once you’ve decided what items you’re going to keep, go shopping for containers so that everything remains organized. Make sure they’re containers you love and that they’re a proper fit for the number of items you will be storing without overcrowding. In addition, measure the space where each container will be stored and take this information to the store with you to make sure that the containers will fit in the space. You can consider getting towel baskets, filing cabinets, drawer dividers, and so on. Once you’re done with your organizational efforts, take action with the boxes. Put the “give away/donate” box in the trunk of your car and drop it off the next time you go out to run errands. Go around the house and put all of the things in the “this belongs in another room” box away. Give back anything that doesn’t belong to you. Repair or clean everything in the “this needs to be fixed or cleaned” box. If you haven’t had these things cleaned or repaired within three months, throw them out. Tape up the “maybe” box, label it, and store it out of sight. Pull it out three months later and go through it. If you haven’t missed any of the items in the box during those three months, throw them out or give them away. You have to take action with the boxes right away or these things will simply become clutter again. Once you’ve established a base-line level of organization you can begin incorporating tips you read or hear about into your organizational scheme in order to make it even better. For example, you can do as Martha Stewart suggests and purchase little sake cups arranged on a nice tray to organize your earrings; you can organize cables in your workstation with Velcro cable ties; and so on. As part of your ongoing effort to keep your space decluttered and organized, each time that you’re about to leave a room spend two minutes picking up after yourself. In addition, you should consider decluttering every six months or so to make sure clutter doesn’t creep back in. Decluttering and organizing your living and work space is an important part of living your best life. Follow the 8-step process explained above, and start creating order and harmony in your surroundings right away. Great post! Very detailed and doable – and it comes at the perfect time! Thanks for all the advice. Each step is going to help me in my decluttering. I especially like no 4. So many times lately I’ve tried – & sometimes failed – on decluttering kitchen cupboards etc, then I would go into the lounge & notice all the stuff that still needs to be decluttered & want to give up! I’m now going to start on my lounge as that’s the one that is irritating me the most.